Eager to showcase your credentials for your next product management job? Our free, downloadable product manager resume sample and writing tips will help you craft a high-quality, eye-catching resume that’ll put you on the hiring manager’s radar. If this resume doesn't inspire you, check out our complete catalog of resume templates. Product manager with 8+ years of experience developing brand strategy, evaluating financial performance, and marketing. Aim to use my proven systems evaluation, operations analysis, and leadership skills to fill the position in your firm. Possess an MS in Marketing with an expertise in market research. Product managers take on a whole boatload of responsibilities, overseeing products from outline and development to rollout and refinement. As a product manager, you’ll own the success of your product line. To snag the job of your dreams, you’ll need an effective product manager resume and matching cover letter. Read on to find how to write a high-quality resume and score points with the hiring manager. Our tips are based on proven methods to make sure your resume stands out. Leadership skills are vital for product managers. Hiring managers will want to know whether you can hit the ground running if they bring you on board. That’s why you should list your skills on your product manager resume. You should include a good mix of soft and hard skills, since product managers have both management responsibilities and technical duties. Still not quite sure what the difference is between soft and hard skills? Check out the ultimate guide to soft vs. hard skills. While your skills section shows hiring managers what you can achieve, your certifications and awards showcase what you’ve already achieved. Given the technical nature of product management, you might need a particular certification to work on certain specialized products. You might need a particular certification to work on certain specialized products. With that in mind, take a close look at the job posting and check whether it mentions desirable certifications. If it doesn’t, mention certifications that are linked to the company’s product line. These two awards show that her performance has been recognized both within and outside her company. As well as receiving an award from her managers, she’s been given an award by a statewide industry-level group for a product launch that she led. Including awards you’ve earned on your own product manager resume helps prove to hiring managers that you’re worth their time. Your professional experience (sometimes called work experience) section is the largest section on most product manager resumes. Thus, you can pack it with impressive facts and achievements to catch the eye of even the most cynical hiring manager. You can optimize your work experience section by including quantifiable data. Things like statistics, metrics, or numbers should be included in as many of your bullet points as possible. Things like statistics, metrics, or numbers should be included in as many of your bullet points as possible. By inserting quantifiable data into your product manager resume, you show the hiring manager not only the type of work you’ve done in the past but also how effective you were when executing that work. Such information gives them an idea of what you’ll contribute to their firm. Remember to keep track of your achievements as you progress through your career. Spreadsheets like Google Sheets and Microsoft Excel are perfect for listing the products you’ve worked on, how many sales they’ve made, and how much profit they’ve generated. This information will be useful when you hit the job market in the future. 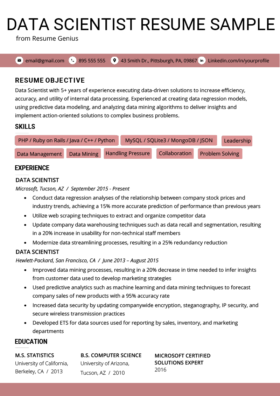 Learn how to write a resume summary if you want to create a resume full of quantifiable data. You also need to use action verbs in your work experience section. Strong action verbs make your product manager resume more compelling. By using them, you present yourself as more competent, more authoritative, and more dynamic than someone using flat, ordinary verbs. 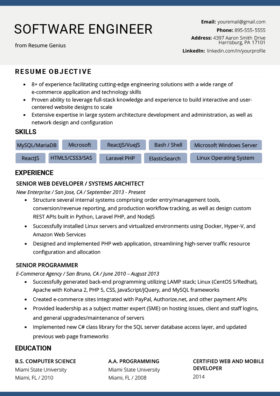 Need some ideas for your own resume? Check out the longest list of action verbs in the universe. Now that we’ve shared our best tips for perfecting your product manager resume, give them a try as you write yours. If you’d like to see more resume templates—all of which are free to use and download—check out our library of professional resume templates. Don’t forget, you’ll need a matching cover letter template. No time for templates? Use our simple, fast, and up-to-date resume builder to create a top-quality product manager resume in a matter of minutes.